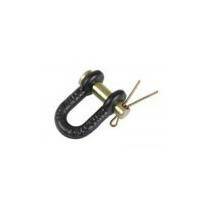 We are one of the most sought after Manufacturers, Exporters and Suppliers of the wide assortment of Clevis Pin. We are flexible in offering the perfectly designed, accurately manufactured Pins that are available in multiple assorted sizes of both straight and twisted utility clevises. We have state of the art manufacturing unit for the fast yet precise production of Clevis Pins that the customers can avail at market-leading prices.